Chile Colorado recipe with tender pork pieces is an authentic northern Mexico dish. Colorado pepper refers to a pepper that is very popular in the gastronomies of the northern states of Mexico. It is also known as “Chile de la Tierra”, “Chile Seco del Norte”, “Chile de Sarta”, and many other names that vary by region in that part of the country. In the northern states, like the State of Chihuahua, the salsas made with Chile Colorado are often thickened with flour and used to prepare dishes like enchiladas, chilaquiles, and the dish featured in this post: Chiles Colorado with Nopales (it can also be made with potatoes). Chile Colorado is not easy to find outside of this region of Mexico, so most people use Guajillo peppers to prepare this dish (that’s what I’ll be using in this recipe). You can also use dried Anaheim or New Mexico peppers as well. There are many recipes out there for making Chile Colorado (like most recipes that vary from household to household), but a lot of them are very similar. Don’t worry about the size fo the peppers bags, you can use them in several salsas and stews, there are plenty of recipes HERE in the blog. To store the peppers you don’t use, place in a Ziploc bag, store in your pantry, and even in your freezer. They will last several months. I love to serve stews with vegetables, but this Chile Colorado is a very comforting, and it is perfect to serve with side dishes like rice, corn or flour tortillas, and the whole o refried pinto beans. While the meat is cooking, clean the peppers by removing the seeds and veins. Place them in a saucepan, cover with water, and turn the heat to medium-high. Once the water starts boiling, turn off the heat, cover the saucepan, and set aside for 20 minutes or until the peppers are soft. Precooking the nopales: Place the chopped nopales in a saucepan, cover with 4 cups of water, and cook over a medium heat. As soon as the water starts boiling, reduce the heat and cook for 5 minutes. After this, remove the nopales from the heat, strain, and set aside. By this time, the water in the pot where you’re cooking the meat should have been reduced, and the meat will start to brown in its own fat. Remove the garlic and onion. If the meat is too lean and doesn’t render any fat, add 2 tablespoons of lard or vegetable oil. Sprinkle with the 2 tablespoons of flour and stir well, browning the pieces of meat. Drain the peppers from their soaking water. In a blender, place the peppers, ¼ of the white onion (chopped), 2 garlic cloves, cumin, and oregano, 1-1/2 of water or chicken broth. Blend on high until you have a very fine puree. Pour the sauce over the cooking meat using a strainer (stir and add more water, if needed, to create a smooth sauce). Season the sauce with salt and pepper, and simmer for 15 more minutes until the meat is really tender and the sauce has thickened a little. Stir in the cooked and drained nopales, and keep cooking for 5 more minutes. Taste to see if it needs some adjustment with the seasoning, I know some of you would like to add more cumin and oregano. Serve with rice, beans, and a stack of warm flour tortillas. Chile Colorado recipe with tender pork pieces is an authentic northern Mexico dish. Colorado is a pepper that is very popular in the gastronomies of the northern states of Mexico. It is also known as Chile de la Tierra, Chile Seco del Norte, Chile de Sarta, and many other names that vary by region in that part of the country. Place the meat in a large heavy pot. Add ¼ of the white onion, 2 bay leaves, and 2 of the garlic cloves. Cover with 1½ cups of water and turn the heat to high. Once it starts boiling, reduces the heat to low and gently simmers. Cooking the meat will take about 20-30 minutes, this will give you plenty of time to prepare the sauce and to precook the nopales. Drain the peppers from their soaking water. In a blender, place the peppers, ¼ of the white onion (chopped), 2 garlic cloves, cumin, and oregano, along with 1-1/2 cup of water. Blend on high until you have a very fine puree. As mentioned above, you can also use New Mexico or Anaheim Peppers instead of Guajillos. You can also use a combination of Guajillo and Ancho peppers. 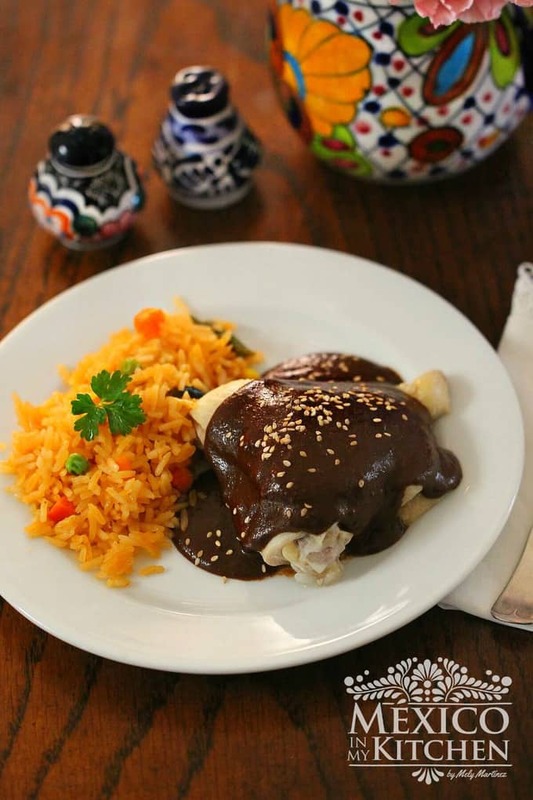 If you decide to use Ancho, use 6 Guajillos and 2 Ancho peppers for this recipe. This dish is not a spicy dish, but I know that some of you might like to add a little bit of heat. If so, add 4 Arbol peppers when prepping the sauce. If you like this Chile Colorado recipe, check this recipe for “WEDDING STEW” from the State of Nuevo Leon. What type of beef do I use for this? You can use beef chuck cut into cubes. So how would this recipe work with potatoes? Would I boil the potatoes first then stir them into the sauce mixture? You can either slightly fry the potatoes cut into cubes or boil them first until cook but still al dente before adding to the sauce. Thank you for trying the recipe. So happy to know you like it, and that you will be trying more of the recipes. Can you roast the nopales over an open flame instead of boiling? Yes, you can grill the nopales over a charcoal or gas grill, you can even make them on a skillet-comal. Sometimes, I even add them raw after chopping them. They will cook in the stew.